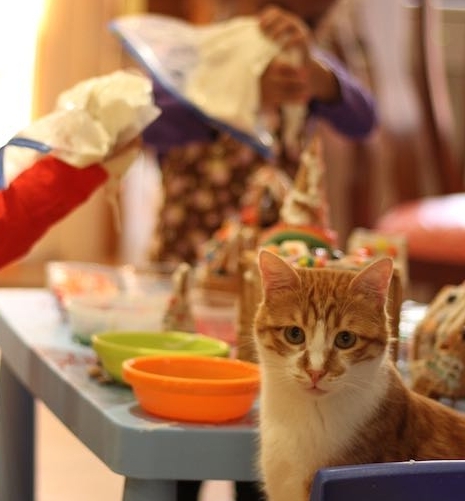 My kids love to help out in the kitchen. However, having a five-year-old and two three-year-olds, I often find that their idea of “help” and mine rarely converge. But I do like the idea of raising helpful kids and I know their willingness will dissipate over time. So, when I have the resolve, I’ll wander online to see what the latest tips and tricks are, or look for “kid-friendly” recipes they can help with. But I have to be honest, my kids are nothing like those Pinterest kids you see, cheerfully rolling out cookies or neatly chopping vegetables. And the food they create? Beautiful butterfly sandwiches? Green grape caterpillars? Super cute, but mine would be eating them faster than I could skewer them. And let’s be super super honest. Having my kids “help” in the kitchen really means 30 minutes of prep, 10 minutes of “help”, 10 minutes of breaking up fights over the “favorite” rolling pin, and 40 minutes of clean up. I could have done the whole thing by myself in 15 minutes. 1. Get their own plates, cups, etc. My three go to a Montessori nursery school, where they are encouraged to do a lot for themselves; frankly more than they do at home. When I realized how much they were doing at school, I wanted to mimic that independence at home (and make my life a smidge easier). I looked around and realized that we could re-purpose a lower cabinet and store all their cups, plates, bowls and silverware where they could access it easily. This way I can tell them to set the table or get a cup to get themselves some water. And currently, they are quite happy to do it. 2. Have access to food. Right next to their cups and plates, I have plastic containers of cereal. We keep these filled, so in the morning or even for a snack, they can easily help themselves instead of wrestling with a huge family-size box. We also have a basket of washed fruit ready to eat in the refrigerator. I still want them to ask first, but unless they’re on their fourth apple for the day, I typically say yes. 3. Help clean up. Where there are kids, there are spills and sticky spots. Or is this just mine? If you happen to have kids like this, having a drawer-full of cloths ready to use is a great help. I still have to remind them, “Go get a cloth. Don’t just watch it drip.” But after a nudge (or two) they wipe it up. Just use a batch of cheap washcloths. They work great and can be used over and over. Having a small broom is also helpful. No, they’re not good at sweeping. At all. But the introduction and broom-control lessons might as well begin now. 4. Help cutting and chopping. Kids love to cut and chop! And once I found these great kid-safe nylon knives everywhere, we were set. We bought the Curious Chef 3-piece set (gotta have three of everything! ), but there are tons of options out there. Granted, this “help” does involve some prepping on my part, but having them ‘help” make the salad almost always leads to them trying the vegetables and even eating some at dinner. Win, win, win. 5. Use a small table. 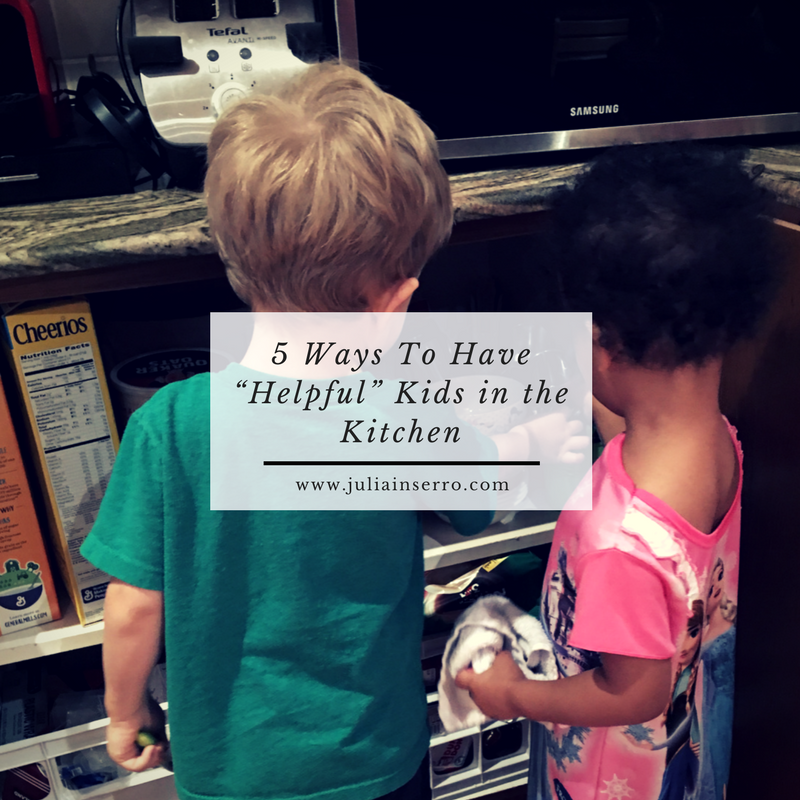 I love the idea of having the kids at counter-height helping Mom or Dad. However, in my reality, with three kids perched on stools or the fancy kitchen-kid-steps, there’s no room left for me. So, instead, we keep a small sturdy plastic table in the kitchen which is great for “helpful” moments. They can sit or stand at it and it’s proven perfect for cookie rolling, vegetable cutting, cupcake decorating, play-doh-ing, and many many crafts. I love that little table! So, these might not be those pretty little catalog-worthy moments, but they are practical tips from a just-trying-to-survive mom of multiples. Now off to find the latest mess; I’m sure there’s something sticky I need to clean up somewhere.